So you guys know I’m obsessed with baking, right? Basically all of my cupboards are stocked with every type of flour you could imagine. I always have an endless supply of ripe bananas for bread, fruit for mixing into muffins, and of course peanut butter for when I’m craving a quick flourless cookie. I need to stop these obsessive baking missions; they’re taking up too much of my time! For instance, I was at Trader Joe’s four times over the past weekend just staring at their cookie butter, debating if I should go for it but knowing that I could quite possibly spoon it straight out of the jar into my mouth. THANK GOODNESS I decided against it. I know myself well around those nut butters (if you can even call cookie butter that). Thus no cookie butter recipes for you today. The whole point of that little story was to inform you that I’ve been baking too much… well, if there is such a thing. I feel like I need some good healthy dinner recipes so that I don’t keep drinking protein shakes and making coconut flour pancakes for dinner. That’s where these bad boy veggie enchiladas come in. 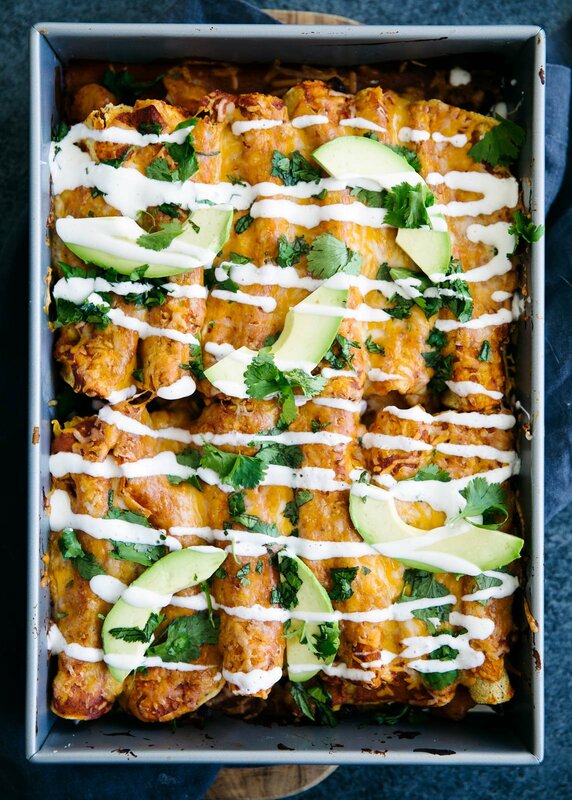 Many of you have made my pumpkin enchiladas, and while COMPLETELY awesome, they aren’t vegetarian-friendly. 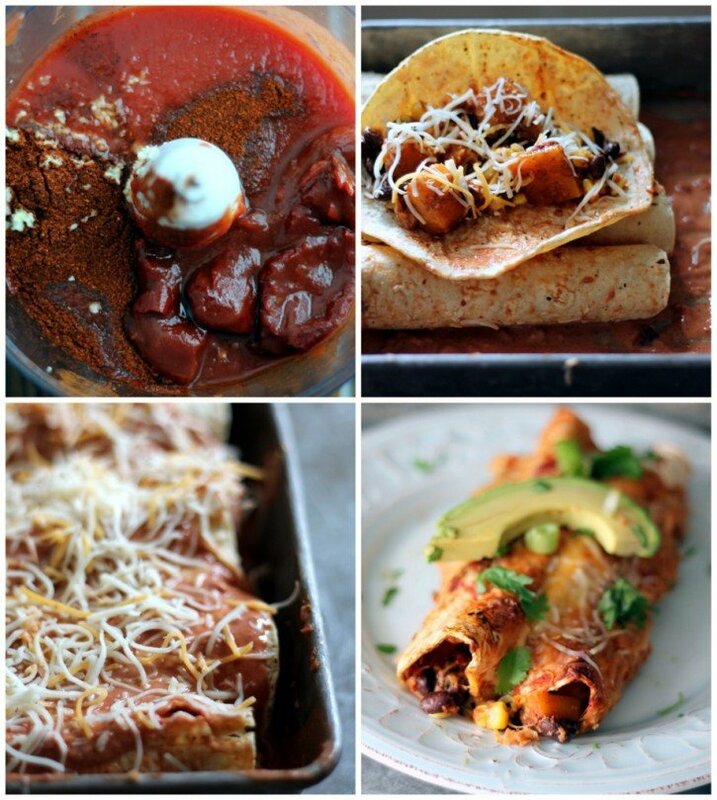 So my weekend mission became to create a new favorite meatless enchilada recipe. These were born, and I must say they are seriously SO good. Not to mention that they’re also fairly easy to make, freezer-friendly, and protein packed. So many wins right there. I actually think I could eat these every day with a big dollop of creamy cool guac. 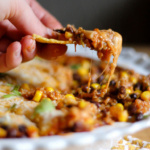 The butternut squash black bean enchiladas combo is incredible and the chipotle greek yogurt sauce is creamy but with a hint of spice. Mmmm hmmm. I wouldn’t dare forget serving these with a margarita because well, I love booze. Just kidding! 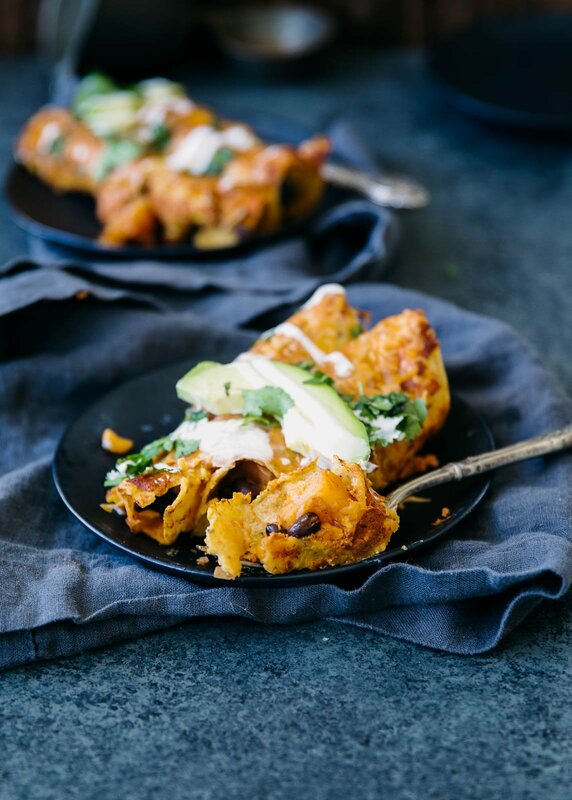 You need these butternut squash black bean enchiladas in your life right now. So get after it! 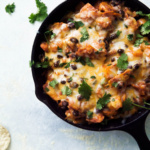 Healthy lightened up vegetarian enchiladas with black beans, butternut squash, corn and a delicious chipotle greek yogurt sauce. 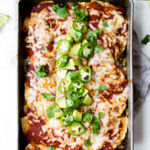 These enchiladas are packed with protein! Make the sauce: Add tomato sauce, chipotle peppers with adobo sauce, greek yogurt, chili powder and garlic to bowl of a food processor; process a few times until smooth. Place in the fridge to thicken it up. Heat olive oil over medium heat in large skillet. Add garlic and diced onions and saute until garlic becomes fragrant (about 1 min). Add cubed butternut squash, stir, and cover for about 8 minutes or until fork tender, stirring occasionally to ensure squash doesn't burn. Add a few teaspoons of water to the pan if necessary to help the squash cook. Once squash is fork tender, transfer to large bowl and add in black beans, corn, and in 1 cup of prepared enchilada sauce; stir to combine. 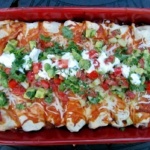 To assemble enchiladas: Add 3/4 cup enchilada sauce to bottom of a 9x13 inch pan and spread around. Warm tortillas in microwave for 30 seconds so that they are easier to roll up. If you find them hard to roll, I recommend dipping each tortilla in a bit of the enchilada sauce; this will make it much easier to roll and add flavor, too! 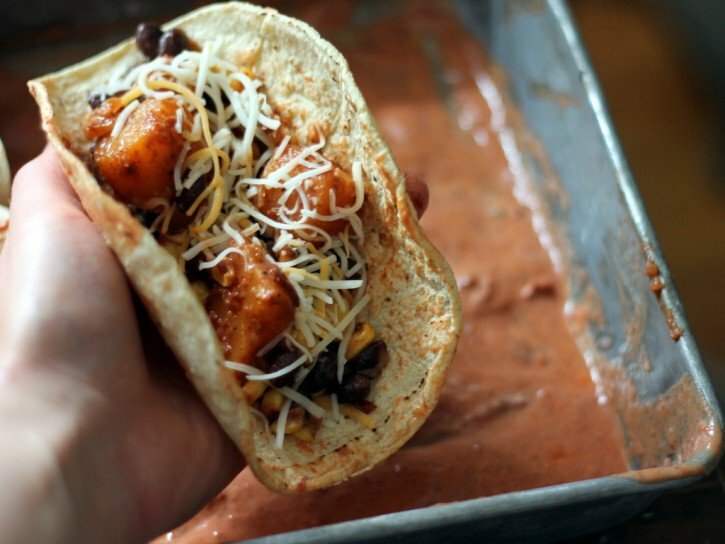 Add about 1/2 cup of the butternut squash & black bean filling to each tortilla and 1 tablespoon of cheese. Roll each tortilla up and place seam side down in baking pan. Pour remaining enchilada sauce over the top along with remaining cheese. Bake for 25-35 minutes or until cheese is melted and the edges of tortillas begin to turn a nice golden brown. Top with extra greek yogurt, avocado slices, cilantro, and green onions, if desired. Makes 6 servings – 2 enchiladas each. You usually can find cubed butternut squash at Trader Joe's; it's much easier than cubing it yourself. Also, feel free to use sweet potatoes instead. 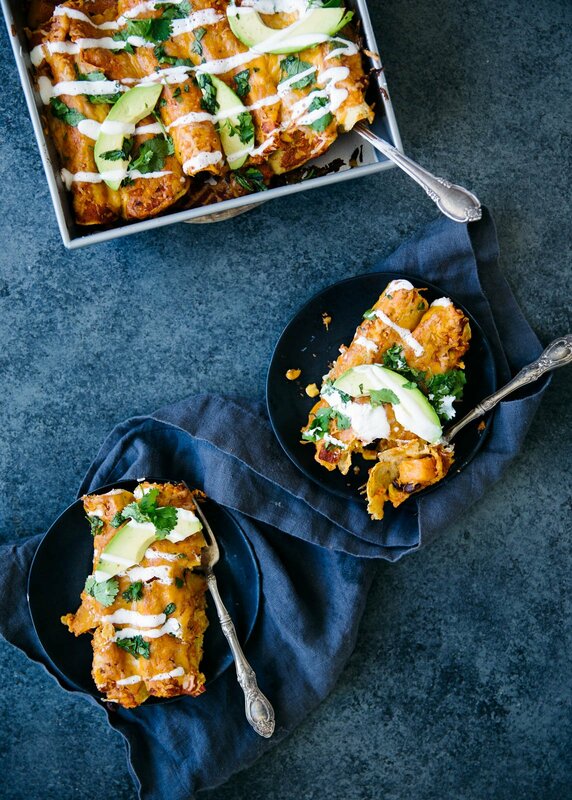 30 Responses to "Spicy Butternut Squash Black Bean Enchiladas with Chipotle Greek Yogurt Sauce"
Monique, I made these today and ooooh they are really scrumptious! The chipotle peppers in adobo sauce truly gave it a nice kick. I’m not vegetarian, so added some cooked shredded chicken to it, and it was truly perfect! Wow you already made them! Amazing. 🙂 I’m happy that you liked them and thank you for leaving a comment! This looks amazing!!! Would this sauce (and your pumpkin sour cream sauce) work well on spaghetti squash or “zoodles”? I’m cracking up at your nut butter comment as I sit here and eat my second spoonful of almond butter. Ugh, so addictive! These enchiladas are keeeeelling me! I love butternut squash and black beans, and it’s been far too long since I’ve enjoyed a good encho. Coooome to momma! Yum yum yum. They are soooo good. xo! Thanks Crystal! Let me know how they turn out for you. I am not a vegetarian but always like trying new things. I have been trying to eat healthier, looking for recipes for things I would actually enjoy eating! These enchiladas were amazing! 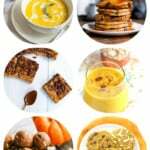 I love your blog and this is the first recipe of yours that I have made. I look forward to making more of your creations! This is a great recipe! How do you feel about making this ahead and then freezing? Will the sauce get all funky? Thanks!!! We love Indian and Thai food around here—anything spicy. I made this tonight and it was FAR too spicy to eat. Are you sure it 1 1/2 tablespoons chili powder and not teaspoons? Curious to know what others think, who have actually made this recipe. Hi Heather! That’s odd. It was probably not the chili powder but instead must have been the chipotle sauce. I’m sorry it was too spicy for you! Thanks Monique. We tried is again, but this time with two chipotle peppers instead of a whole can (which has about 10 peppers?). It was delicious, thanks. Will totaly do the same next time. Was really too spicy (and I’m south american eating spicy food). Beside that, the recipe was really good. I made these last evening for my boyfriend & me for dinner and they were absolutely delicious! This is coming from a guy who wasn’t even sure if he liked butternut squash when I mentioned to him what I was making (I don’t think he had ever tasted it before 🙂 ). Definitely had a kick from the chipotle peppers. 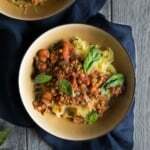 Soooo tasty and hearty even though they are meat free! Thanks for the recipe. I love everything on your site! Hi! 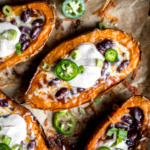 I was going to make this recipe with my friend and I’m vegan so I was wondering if you think vegan sour cream would work in place of the Greek yogurt? Thanks! Sure! I have never tried vegan sour cream so I’m not positive how it would turn out, but feel free to give it a try. Also, I would recommend cutting back on the chipotles if you don’t like spicy food. It tastes like regular sour cream to me so I guess I’m just asking if sour cream is a good replacment, and I loveeeeeeee spicy food so it won’t be a problem! Thanks so much for responding I’m very excited to try this my friend said she loved this recipe!! I’ve made this three times now for my fiancee and I, and we absolutely love this recipe! He says it’s some of the best enchiladas he’s ever had. Thanks for such a great recipe. These are so great and my whole family loves them. I was wondering if I could make ahead and freeze them? Oh no, sorry you had that experience. You might want to reduce the amount of chipotle peppers to 1 or 2. This was a hit in my household! Will be making again soon. I made these tonight and they’re delicious. The Chipotle peppers in adobo sauce give it a nice kick! I used about 4 peppers and poured some of the sauce from the can into my sauce. They’re excellent! Thanks so much for sharing the recipe. So I cannot find chipotle peppers at all at any of the grocery stores around me (Safeway, Natural Grocers, TJ’s)…has anyone else had this issue and Monique, can you tell me where you find yours? I know you call for these in a few of your recipes, and I think I just subbed green chiles in the past but I looove chipotle flavor so I wish I could find it at a tradtional grocery store! May have to hunt down a latin american grocery store (or go online).